Can you shame God? The biblical answer is yes. Though this may initially sound sacrilegious, the fact that people shame God pervades scripture and profoundly impacts your relationship with God. People despise and scorn God. In other words, we fail to honor and glorify God. This idea appears throughout the Bible. Excursus: The Meaning of “Despise.” The Hebrew word naats means to “show contempt,” (NIV) “spurn,” (NAS) or “reject.” David deSilva explains, “assigning a low value to something or someone, then treating that thing or person according to the standards appropriate for that assigned value, stands behind the term despise” (IVPDOTP, p 435). The word basically means, “to treat with low value.” It is our failure to recognize God as the King worthy of ultimate honor (Mal 1:14; cf. 1 Sam 2:30). Beyond the explicit verses, the clearest biblical example of shaming God is the death of Jesus in the passion narratives. The powers of Rome purposefully used the cross as an instrument of extreme humiliation and rejection. The shame of the cross also has a theological explanation—our shaming sin caused his death. Jesus died to pay our honor debt and absorb our shame. When we dishonor God and shame others in God’s image to grasp status for ourselves, we participate in part of the crucifixion. Humans can (and do) belittle and despise the glory of God’s name. Sin is sin because it breaks relationship with God and dishonors him. Whenever we worship or value the creation (i.e., idolatry/sin), that steals glory from God. Ultimately, this is not a statement about God’s actual glory, but really an indictment of our shameful/shameless hearts that misattribute honor. Our failure to honor God does not diminish his actual value and worth (just as our rejection of the Truth does not negate its truthfulness). God is infinitely glorious and honorable, regardless of our actions or behavior. Our sin is the failure to radiate God’s glorious honor as we were designed. In this way, it could be said that we humans, you and I, shame God. Is there also a potential positive way to use shame in one’s relationship with God? Old Testament examples: Abraham in Genesis 18 (Sodom and Gomorrah bargaining). Moses, during various episodes of Israel’s rebellions (Exodus 33:12-23, Deut 9:28), appeals to the danger of God’s name being shamed among the nations. Habakkuk asks God to act, lest God’s character and nature be compromised, and this would be similar to various OT laments (Psalm 77:10, for example). In the New Testament, Jesus seems to suggest in Luke 11:1-13, that we should be persistent in prayer because God’s name (honor) is already at stake among His people, and we are encouraged to shape our prayers to put God’s glory at stake. The overall positive idea, then, would be that believers can notice where God’s honor seems to be compromised and work to defend it, and even appeal to God to restore it. Would this be a positive use of shame in a relationship with God? Dan, great comments. Yes, I agree with you–this fact does motivate us in a positive sense to defend and display God’s honor. Your citations show this is common in Scripture (one could add Ps 44, Ps 74, and Mal 1–2 to your list). Another implication is understanding how the life/death/resurrection of Jesus likewise restores God’s honor and removes the shame we cause. I simply didn’t address the positive implications because I wanted to establish this one point in the post. Great citations, Roy! Interestingly, the verses you mention in Ez 36 are about the (re)new(ed) Covenant, so no surprise NT authors also pick up on that. Thanks Andrew, for finding and sharing that extending quote from Anselm. He explains it better than me! God does not deserve to be treated in a shameful manner. Why do we thoughtlessly behave so horrid? In the way I currently understand things, a primary reason for shaming someone is make them feel shame. In the way you are using “shaming” here, does God end up feeling shame? 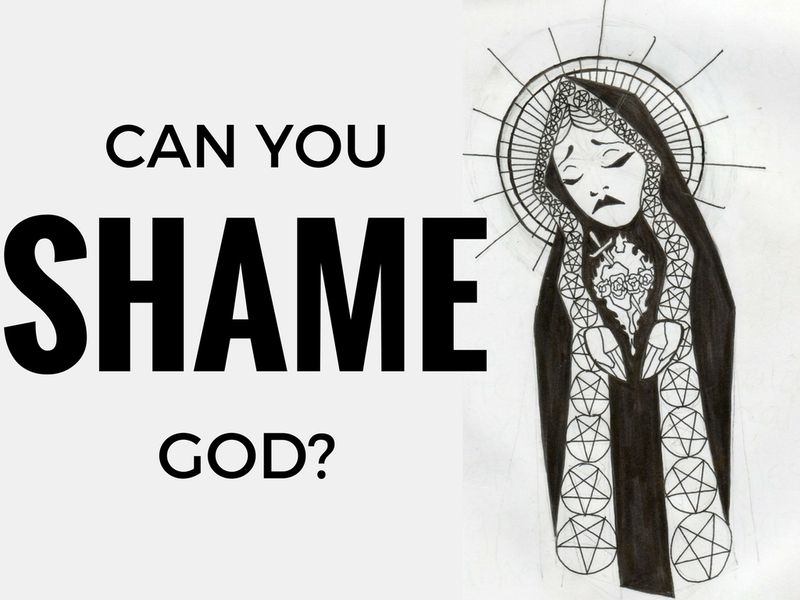 Yes, God does feel “shamed” (like a king whose servant just spit in his face), but not “ashamed” (like a school child that has been abusively scolded). I would correct your first sentence though–we don’t shame others just to make them feel shamed, but to create a relative sense of status for ourselves (i.e., Cain with Abel). And so when we shame/dishonor/de-glorify God, it is not with the specific intent of shaming Him, but it is usually the inadvertent result of seeking glory outside of Him. My guess is that feeling “shamed” (in your example of a king and his servant) would be viewed as bad primarily (but not entirely) because, in order to continue his rule, an earthly king needs his subjects/servants to keep honoring him. Knowing that, if others learn from this servant’s actions and join in his defiance, this king may end up being removed from power, he will most likely feel the need to decisively undo or “fix” this defiant challenge. But isn’t God in a different category? His position as King of kings (and His actual glory/honor) cannot be threatened in any way by acts of defiance or dishonor. The only thing that happens when someone spits in His face is that their extreme shamefulness is revealed for all to see. Any act of defiance will always eventually end in regret and will always result in a breathtakingly honorable and loving response from God. Those who feel no regret, who can’t/won’t see the honor/love in God’s response, or who view this response as somehow inadequate are shamefully ignorant of the way things are. Doesn’t God defend His name and reputation in biblical accounts, not because His feeling “shamed” needs to be undone or fixed in some way but because He can’t keep Himself from loving defiant sinners? Doesn’t He care about His name and His reputation in the eyes of defiant sinners because, if they don’t know more about the One who loves them deeply and is beyond their understanding, 1) they won’t know what love, honor, shamefulness, etc. look like; 2) they won’t be able to be able to understand their defiant acts for what they are, shameless acts done by someone who obviously has no sense of shame; and 3) they won’t know that they need to and can call out to Him for His undeserved mercy, allowing Him to take away their shame and give them the honor of being His children? Would you mind saying more about what you mean by “a relative sense of status for ourselves”?